Happy happy Monday, everyone!! I hope you all had a wonderful weekend. We had a nice relaxing weekend. Hung out and did some crafts with the munchkin Saturday morning, went out for burgers, then went to the local farm to feed the new calves, we were going to stay and enjoy some fresh ice cream but a storm came through so we decided to go "storm chasing" and ended up driving through the woods and did a little hiking in the rain. Yes, I know, a little odd for us to have burgers before feeding the calves. I guess it's better than having burgers AFTER feeding them? Either way the burgers were delicious, and the calf we got was adorable! He was a month old, and loved the attention. He would lean into our hands when we were petting and scratching him just like a pup. Sunday, was relaxing day with the family and laundry day. It was nice and much needed. 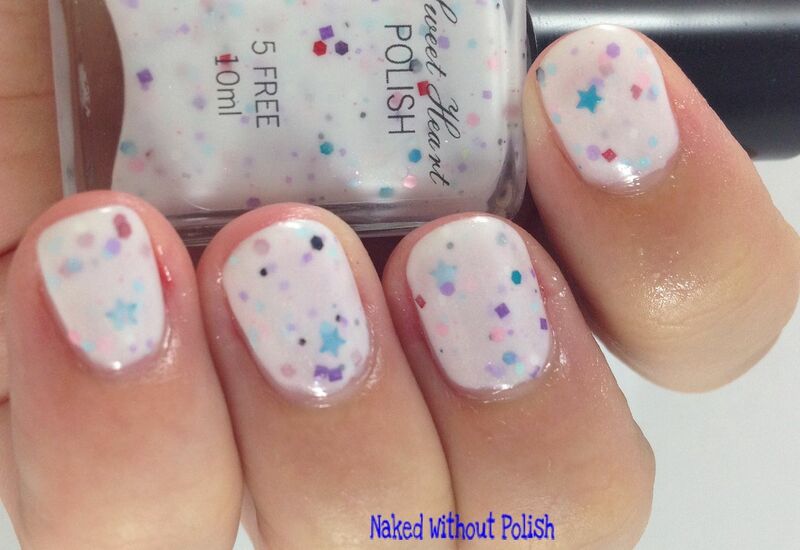 Back to the reason you came, Sweet Heart Polish's new collection. The Sweet Summer Memories Collection is a set of four white crellies. 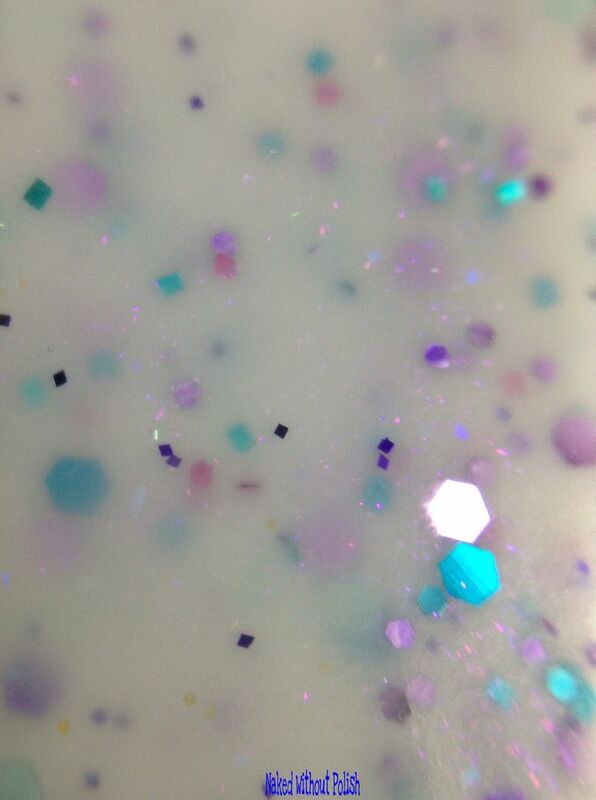 Each filled with glitter and iridescent micro flakes. 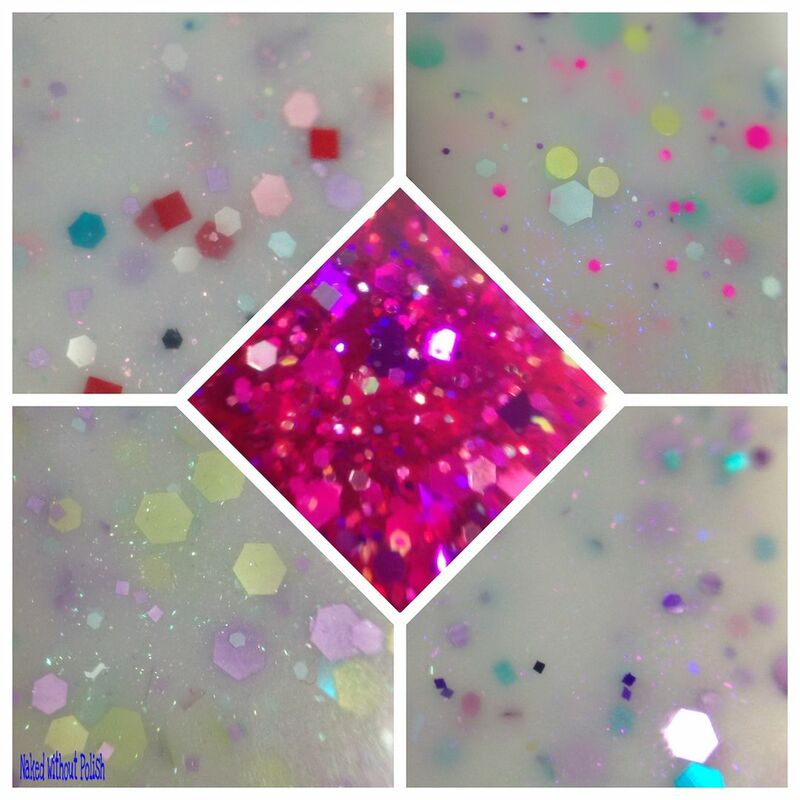 In addition to the Sweet Summer Memories Collection, Cassandra is releasing a special polish celebrating her two year anniversary of making beautiful polish. You won't want to miss any of these! Warning - I had a series of unfortunate breaks. Nubbins ahead. 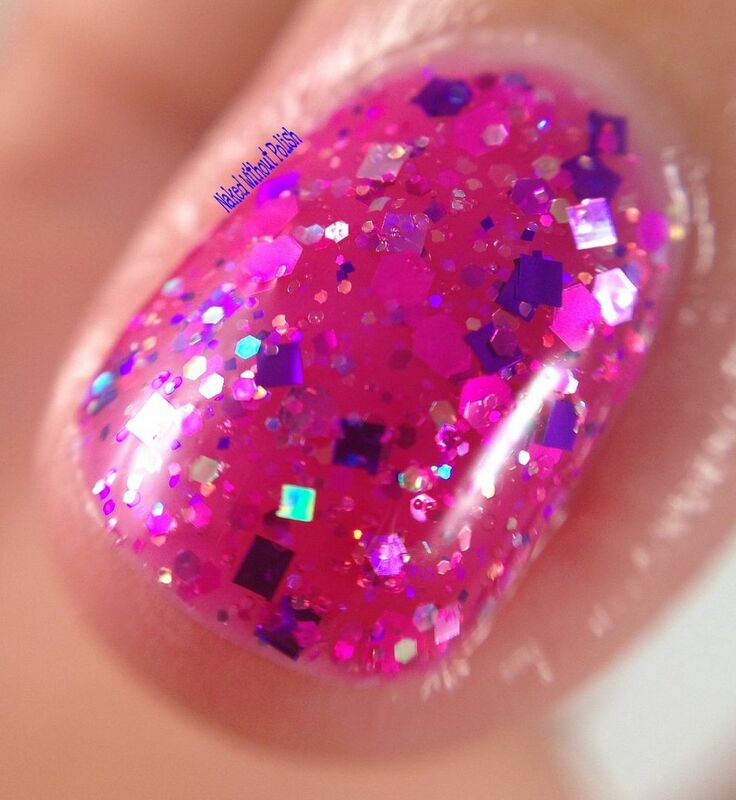 Two Be Berry Sweet is described as "a lovely bright pink jelly with an explosion of purple and magenta matte glitters, pink and silver holo glitters, and iridescent glitters". 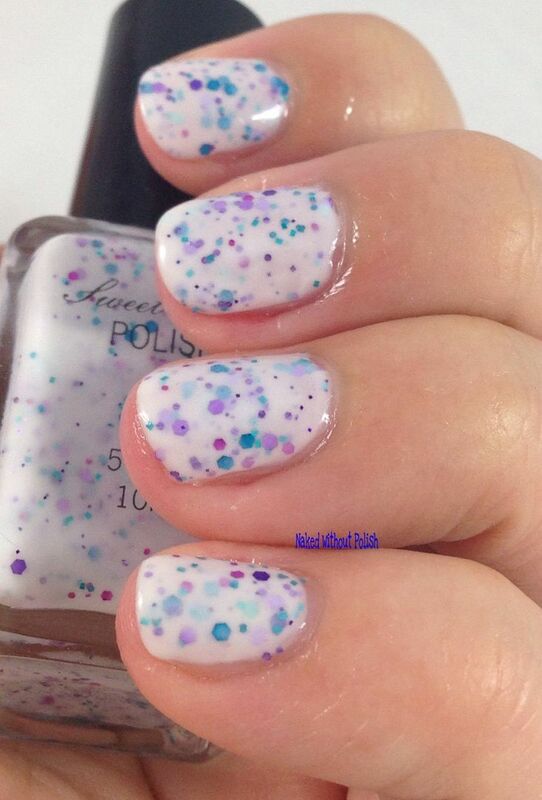 Shown is three coats of Two Be Berry Sweet. 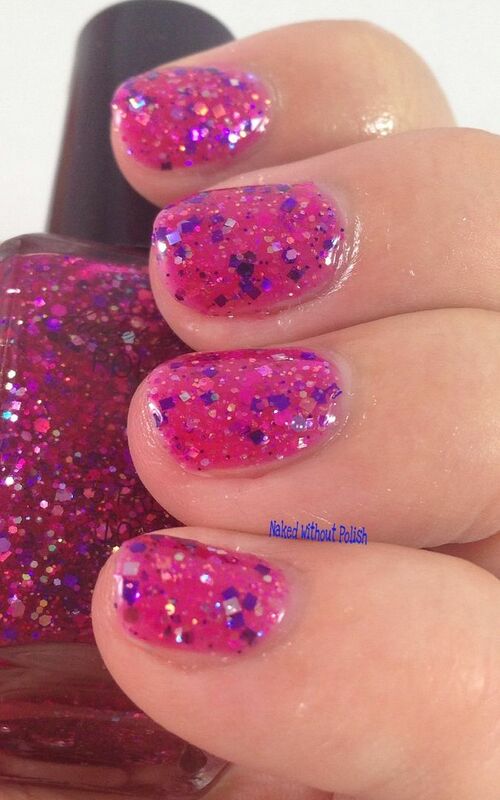 Not a part of the collection, the celebratory two year anniversary polish is Two Be Berry Sweet. 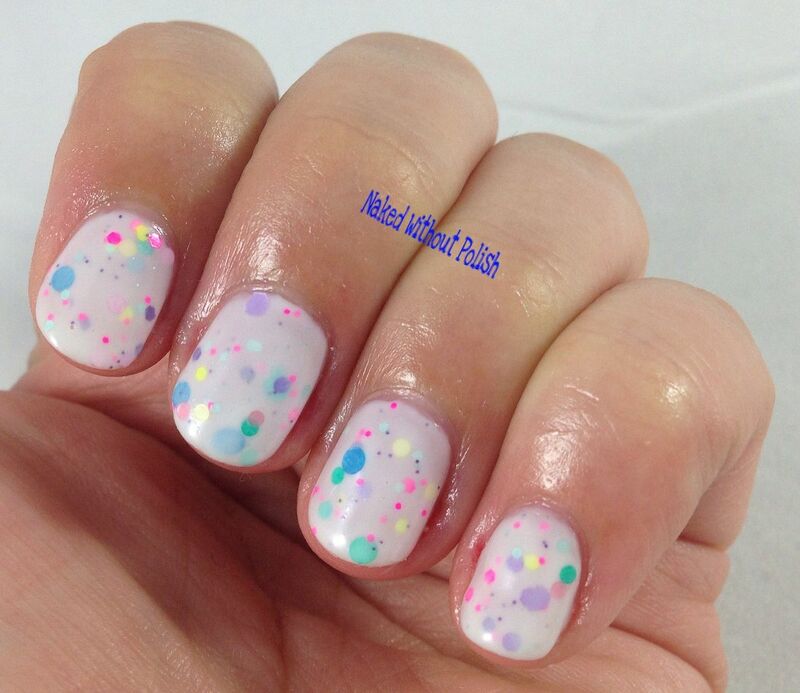 A wonderful play on words, and a beautiful polish. 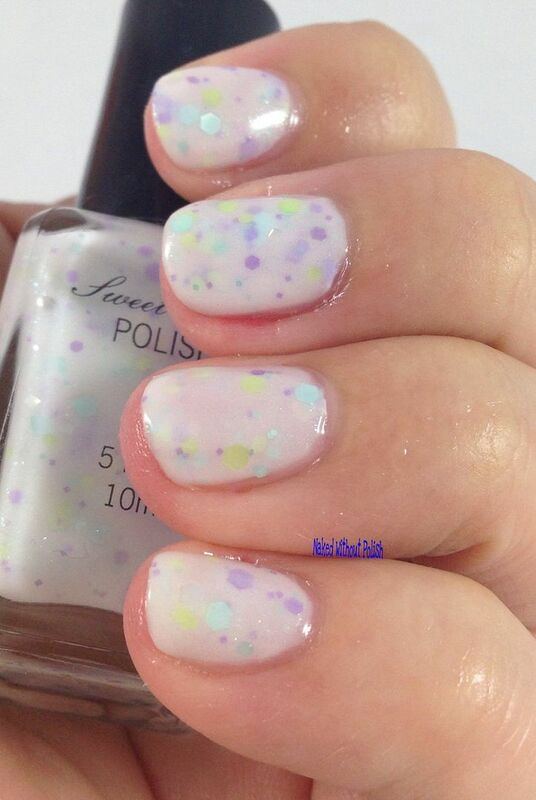 Smooth application without fishing for glitter. Love a squishy jelly? 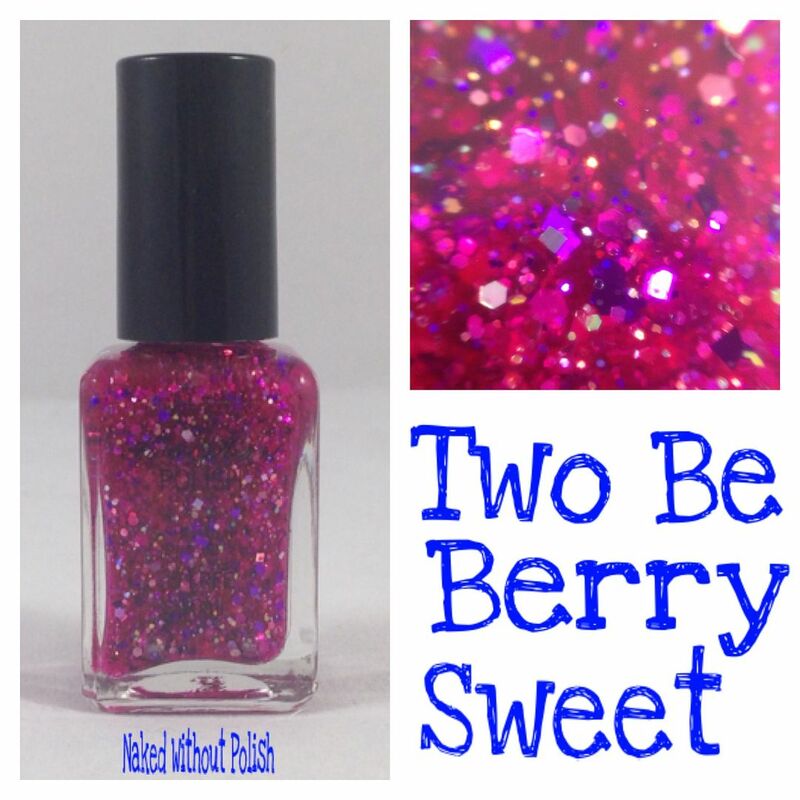 Two Be Berry Sweet needs to be yours! 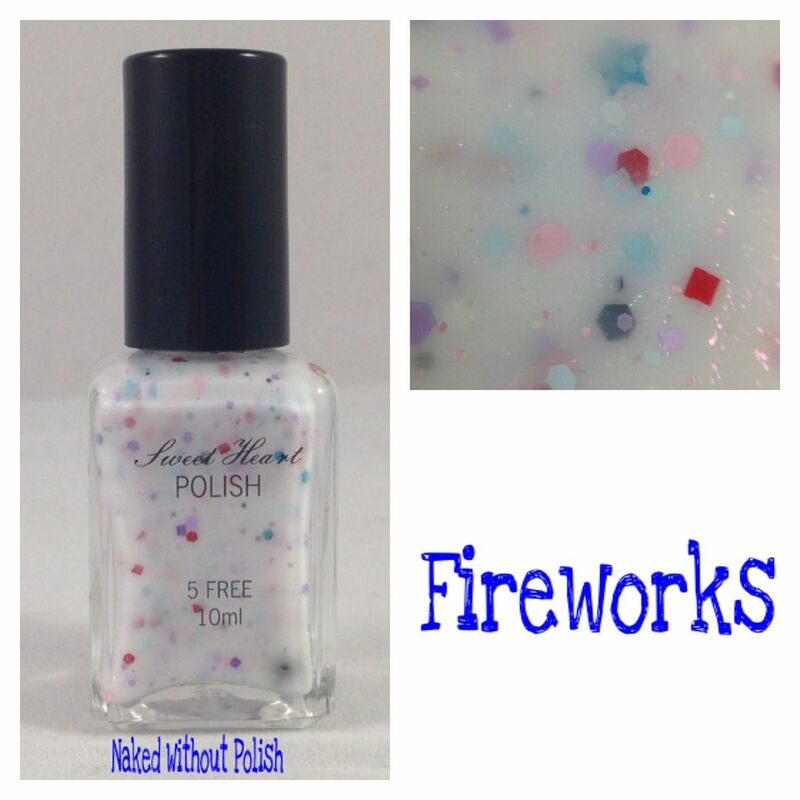 Fireworks is described as "a white crelly base with a mix of red, teal, and pastel glitters, mini teal star glitter, and a red flash of shimmer". 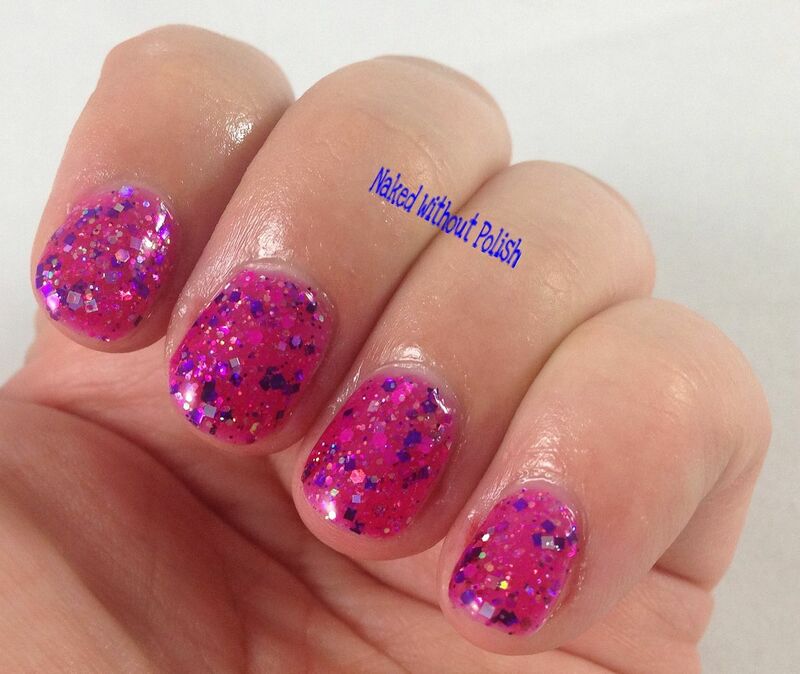 Shown is three coats of Fireworks. 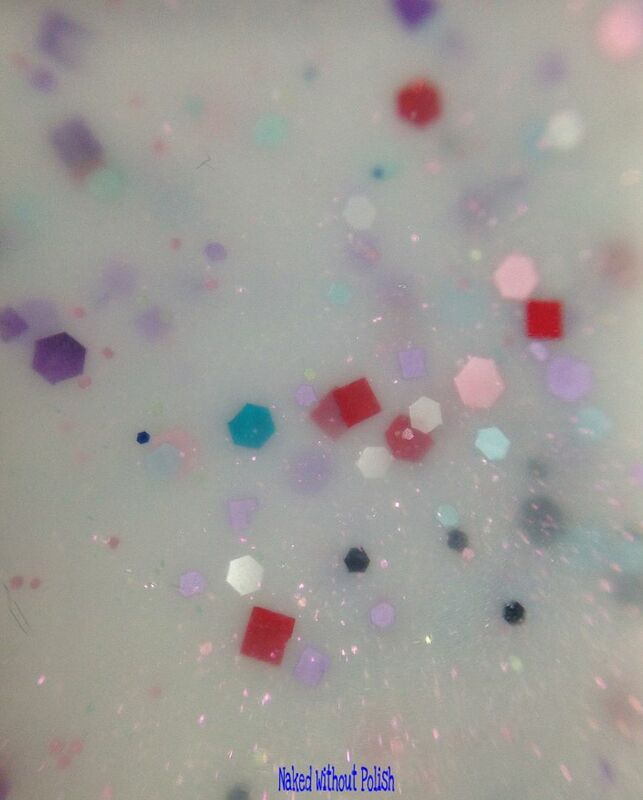 Most of you know I'm not a fan of shaped glitter, but these mini stars are so freaking cute! It's really hard to dislike something that is mini. 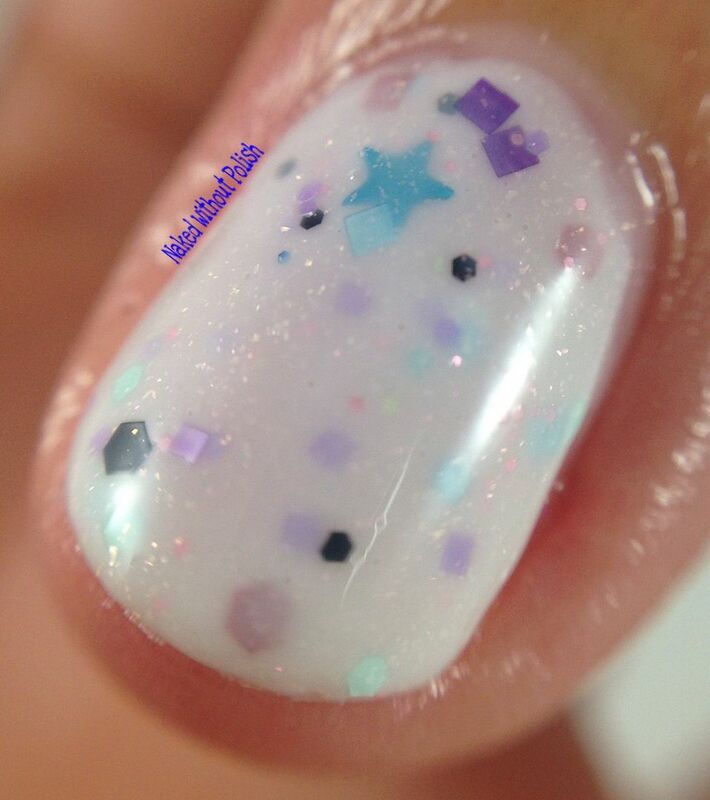 Fireworks had an incredible application and I didn't have to hunt for any glitter. 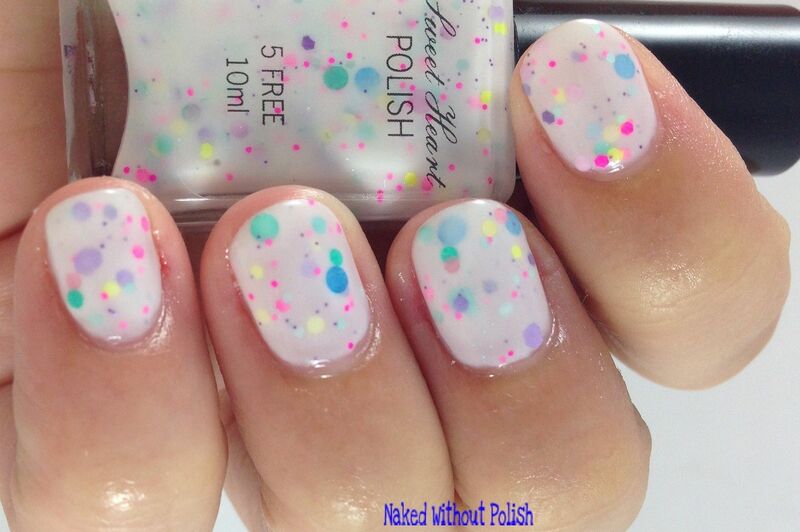 I can definitely see myself reaching for it to use in a 4th of July mani. Shown is three coats of At the Drive-In. 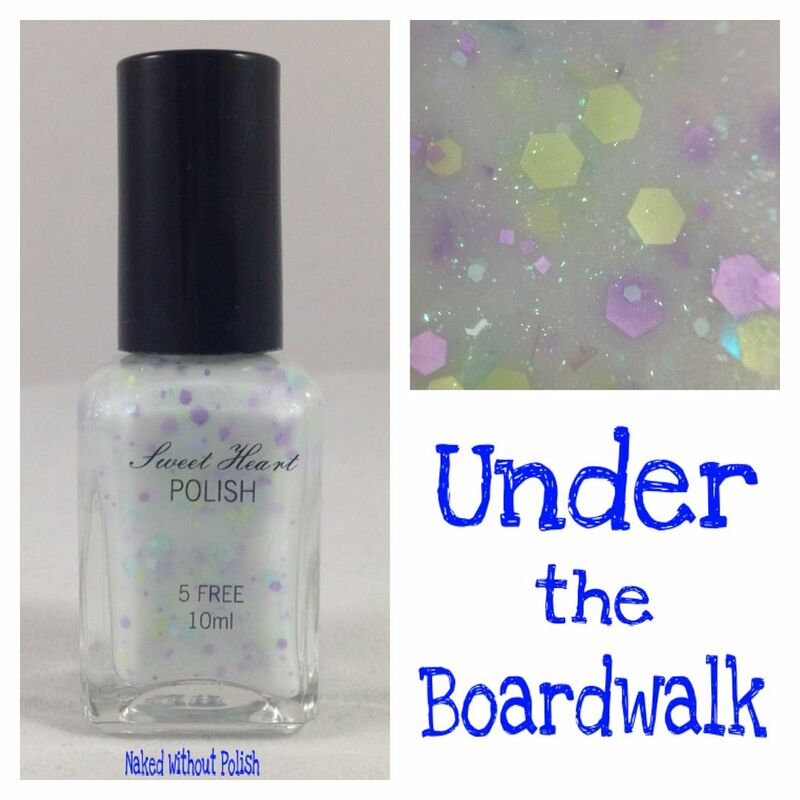 Under the Boardwalk is described as "a white crelly with a mix of pastel purple and green glitters with gorgeous green micro flakes". Shown is three coats of Under the Boardwalk. 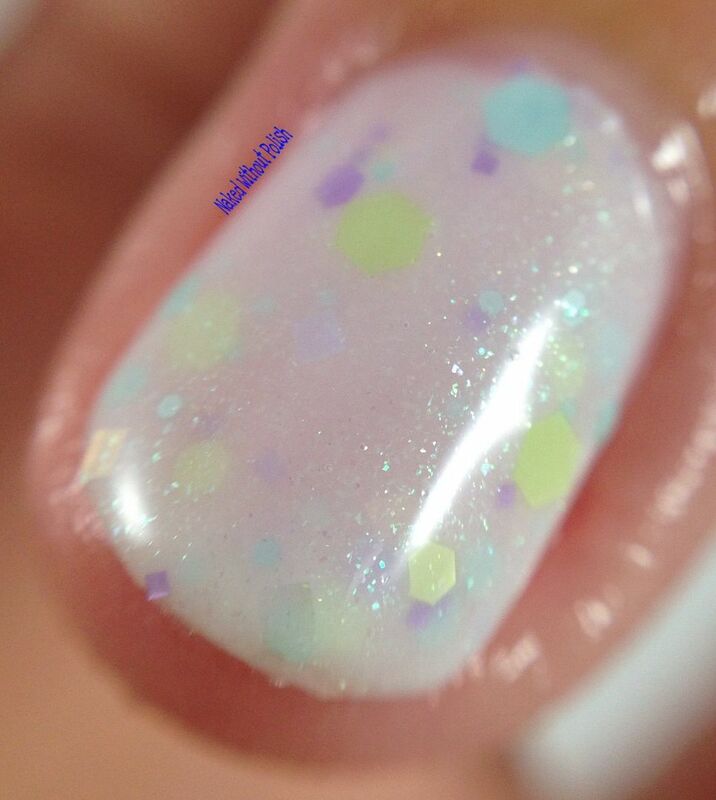 My favorite from this collection, Under the Boardwalk is such a lovely, subtle beauty, but it makes a statement. 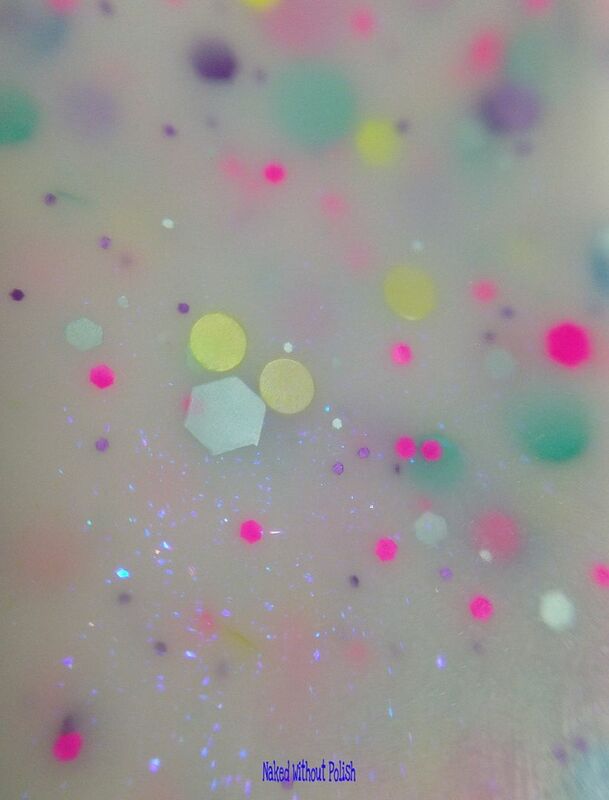 The micro flakies are loud and proud in this one. It is more sheer than the other three, but it is still opaque after three coats. 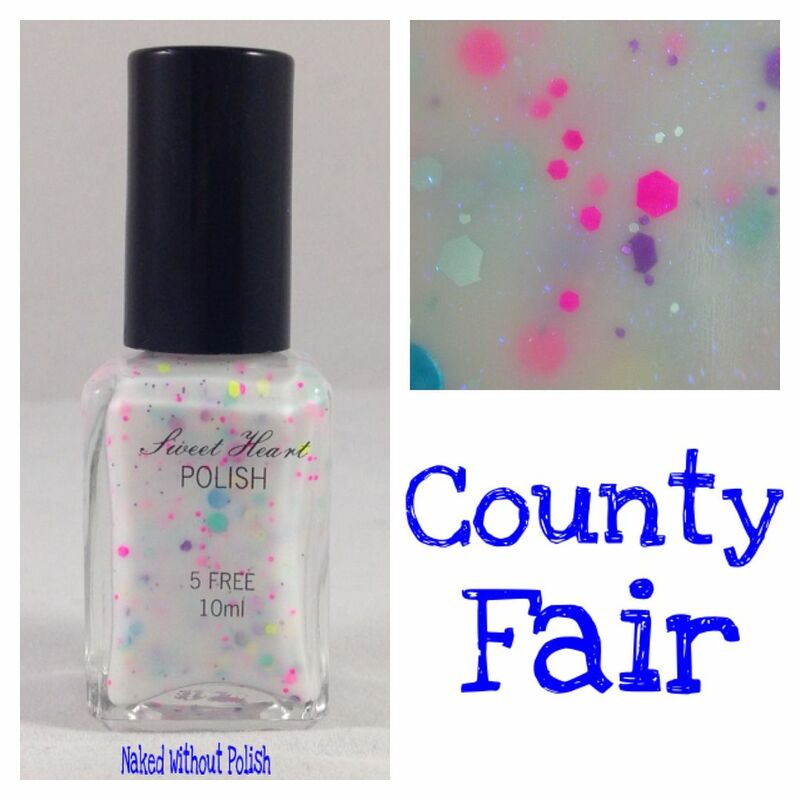 County Fair is described as "a white crelly with a mix of fun neon glitter with some satin pastel circles, and bright blue micro flakies". 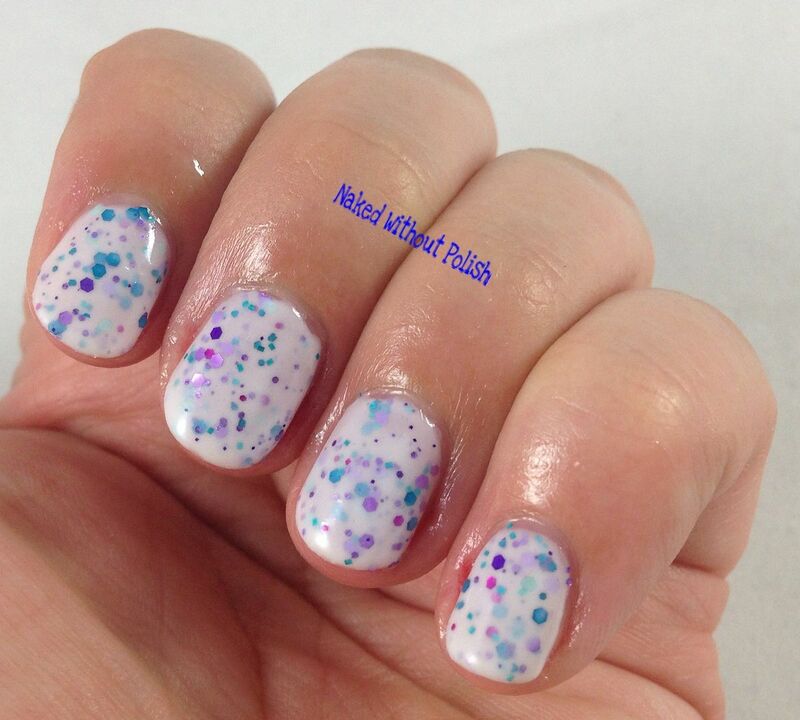 Shown is three coats of County Fair. 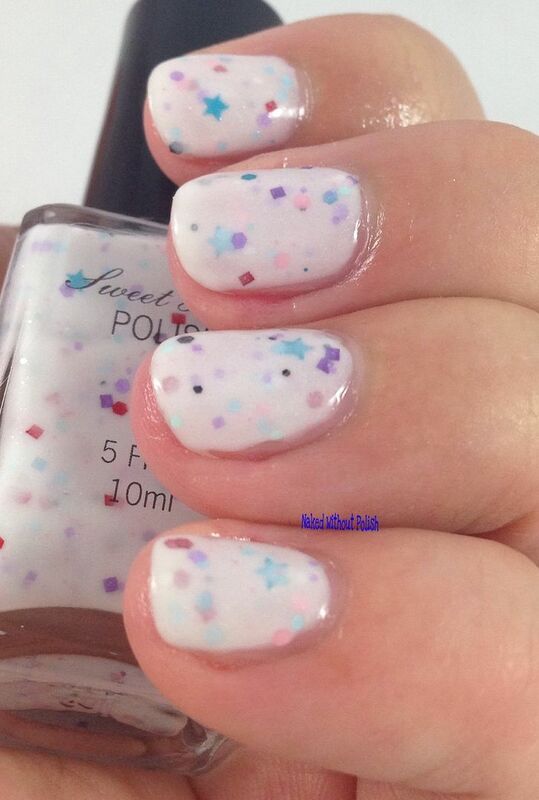 A close second for my favorite in this collection, County Fair is so much fun! All that it is missing is funnel cake and corn dogs! County Fair is sure to put a smile on your face and won't leave you broke. 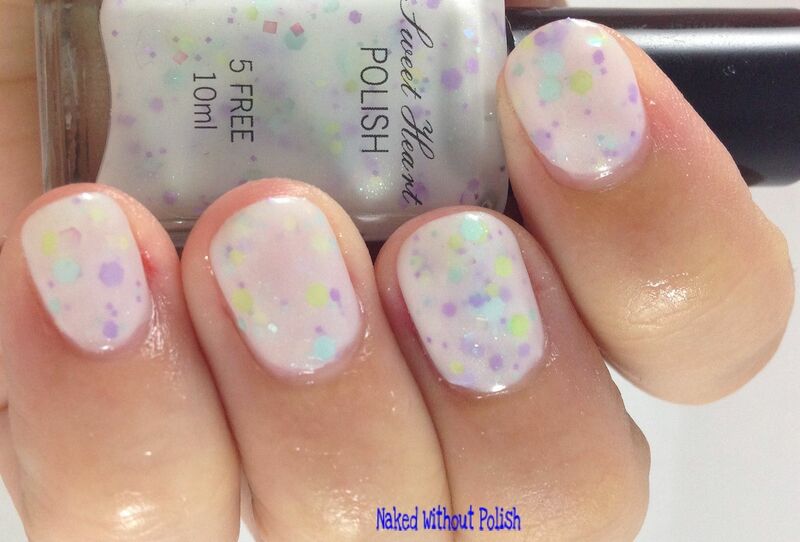 While everyone is releasing neons, Sweet Heart Polish's Sweet Summer Memories Collection is a breath of fresh air. Every single one had a perfect application with zero issues and barely any clean up was needed. 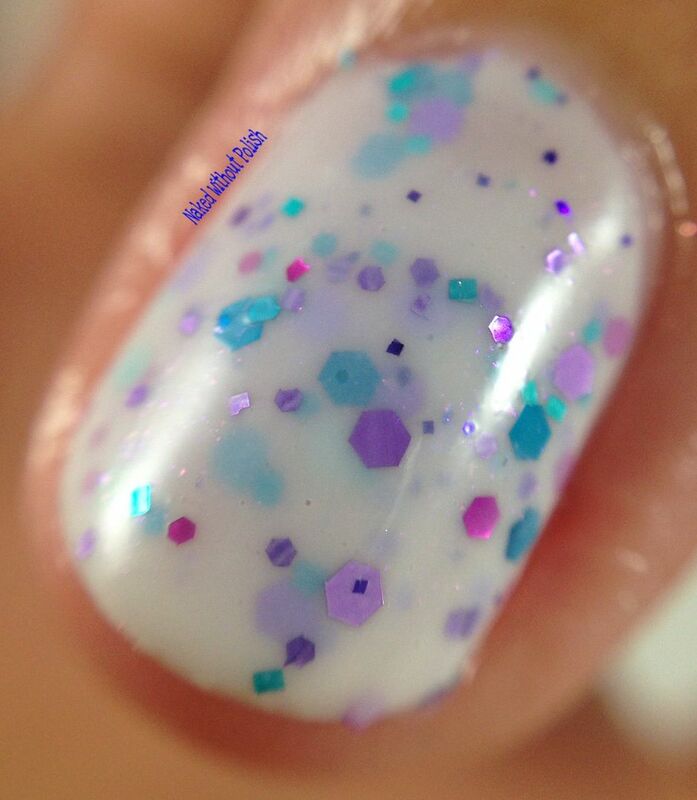 Her anniversary polish, is squishy, jelly, perfection! You can't go wrong with any of these. They will all be available in her shop today at 8 am PST for $9 each. 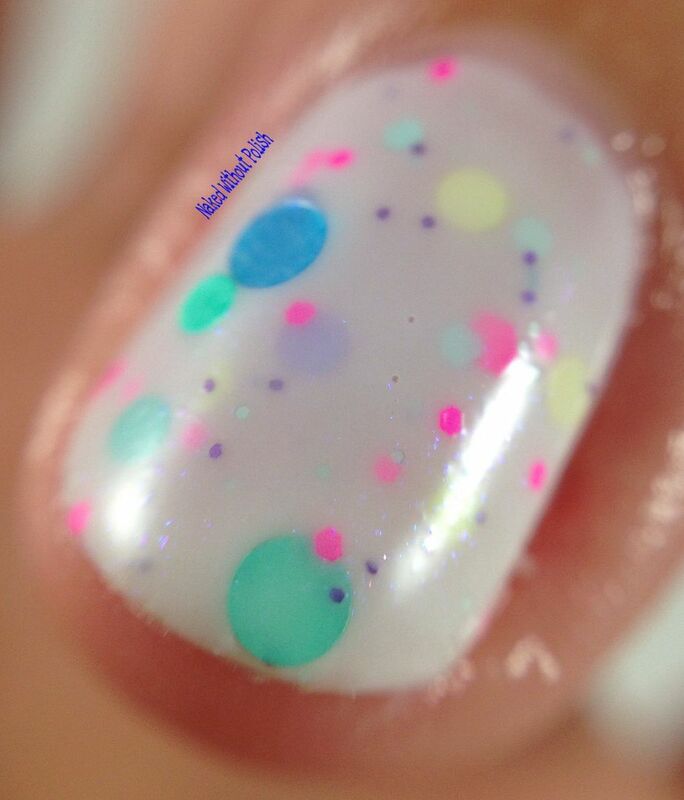 Just because, here are more macro shots. 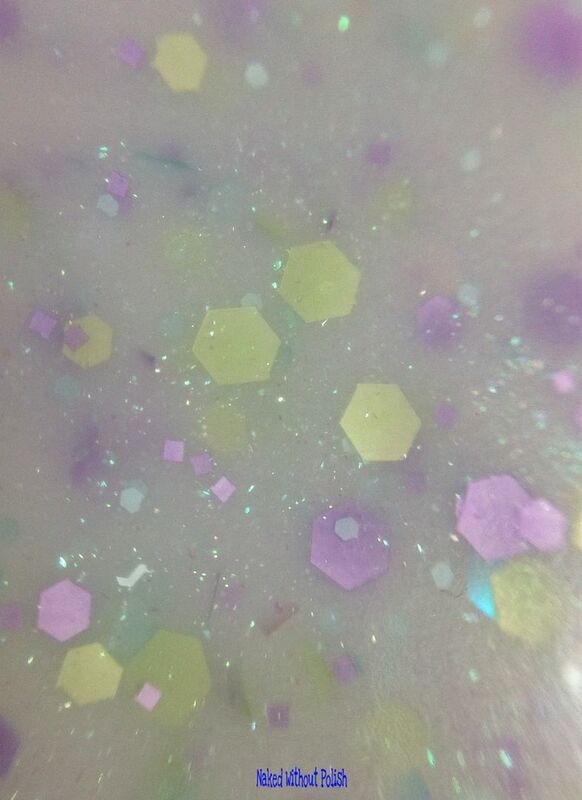 I really wanted you all to see the flakies hidden in the base. 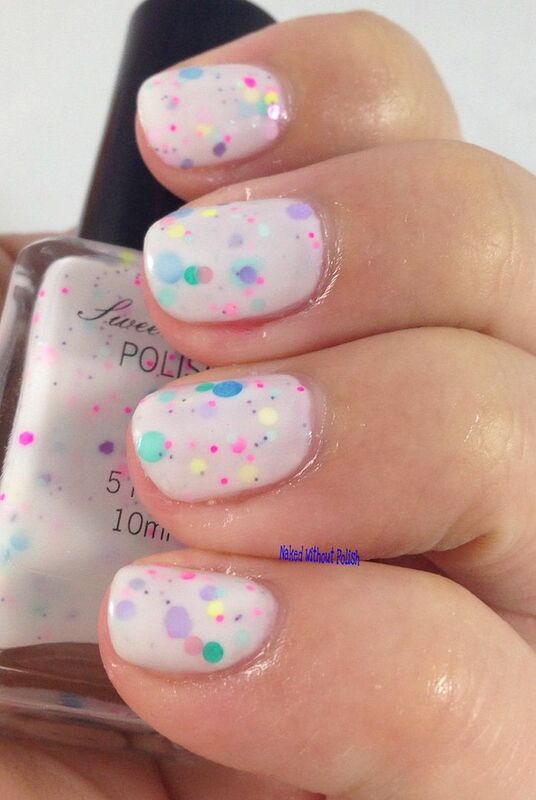 Fun on their own or as the perfect accent nail, the Sweet Summer Memories Collection isn't one to miss. Memories are meant to be cherished, I'm definitely cherishing these beauties. And did you see her new bottles?! I'm loving them. They feel so comfortable in your hand. Not too bulky, not too small. That just right feeling that Goldielocks taught us about.